Judge Conley made quick work of striking down defense attorney Scott Sanders’ motion for the removal of the death penalty in Daniel Wozniak’s sentence. At this point in the sentencing hearing, Jude Conley hadn’t actually said the words “death sentence,” but there was no doubt in anyone’s mind Daniel was about to be sent to San Quentin. When court resumed after lunch (I ate crackers, cheese, an apple and a chocolate protein bar), it was time for the victim impact statements. Now was the opportunity for those who loved Sam and Julie to speak, unhindered, on how the murders directly affected them. Considering the number of people who came to court that day, I was expecting a lot more people to speak, but only four family members ended up giving statements. Sam’s cousin Leah was up first. She talked of how she and “Sammy” were more like siblings than cousins. She described Sam as kind, loving and generous. She acknowledged Sam’s “difficult” time as a young adult, but her cousin had redefined himself in the Army and was trying to “pay society back” for his mistakes. Leah imagined her own nine-year-old daughter speaking directly to Daniel Wozniak, and how the child would tell him that her uncle was only trying to help him and would have loaned Daniel the money. Sam’s aunt Miriam spoke next. She said she should be able to speak for seven hours, one hour for each year the Herr family waited for justice. Miriam’s anger toward defense attorney Scott Sanders was palpable. She accused Sanders of trying to gain his own glory from Daniel’s trial. Sam’s aunt finished her statement with a hope that Sam and Julie would be guarding the gates of heaven to keep Daniel from entering when he dies. The final member of Sam’s family to speak was his father, Steve Herr. His wife Raquel stood next to him. Steve made a request of all of Sam’s fellow veterans who’d come to court that day. He wanted them to join him and Sam’s mom at the podium. I think there were eight of Sam’s Army friends flanking the Herrs and supporting them during Steve’s statement. He began by thanking Judge Conley, Matt Murphy, and the Costa Mesa Police for all their hard work. He expressed sympathy for the Kibuishi family. Steve Herr said he could speak for hours about his son Sam, who he and Raquel loved with all their hearts. A letter was read from Army Capt. Benjamin Kilgore, Sam’s troop leader in Afghanistan. Capt. Kilgore praised Sam’s character and bravery as a U.S. soldier. Steve Herr looked at Daniel and reminded him about the man he’d murdered, stating that Daniel Wozniak is the “poster boy” for the need of a death penalty in California. At the end of his victim impact statement, Steve Herr voiced that his “only regret” was that the state of California wouldn’t let him “kill this coward” himself. Do you think it would make Steve Herr feel a little better if he could punch Daniel in the face really hard just one time? Daniel is my friend, but I certainly wouldn’t begrudge any of Sam’s or Julie’s people the opportunity to punch him in the face. I don’t think Daniel would even complain about that. I really don’t. You know what though? I think some of them would trade the chance to punch Daniel if there was an opportunity to punch Scott Sanders in the face. I’m not saying it’s deserved, but there is a lot of anger aimed at Scott. The final victim impact statement was made by June Kibuishi, Julie’s mother, while her husband Masa stood next to her at the podium. She looked directly at Daniel and began, “On May 22, 2010, you took my beautiful precious daughter’s life,” by murdering Julie and then disgracing her to use her as a decoy. June may have been the only Kibuishi family member to speak, but she packed enough of an emotional wallop for her entire family. I’ve wondered how the families made the decision of who would talk at Daniel’s sentencing hearing. Were there some family members who knew they wouldn’t be able to even get words out, or others who though they might explode with anger if they looked at, and spoke directly to, Daniel Wozniak? It makes me think of footage from the Jeffrey Dahmer trial. A woman who was the sister of one of his victims had to be restrained by deputies when she came at Dahmer screaming, “Jeffery, I hate you!” No, I am not comparing Daniel to Jeffrey Dahmer in any way. I’m just contemplating the level of anger a person must feel in that situation, and how challenging it would be to keep your calm. Daniel did look directly at the speakers during their statements. Well, actually I couldn’t see him during Steve Herr’s statement because of all the Army guys (Not that I’m complaining about the view at that point). I know many people probably saw Daniel as expressionless because of what appeared to be a lack of emotion on his face. One journalist asked me if I think Daniel is a psychopath. I said no. I don’t. I think he was just really listening, and probably trying not to have any expression on his face. If he cried, people would think he felt sorry for himself or, worse yet, he was “acting.” I saw a man who is genuinely contrite, but that’s probably because I know he is. It was 2:15 PM on September 25, 2016, when Judge Conley read the official sentencing. Daniel Wozniak was given two sentences of twenty-five years to life (the extra sentences were unexpected), and the death penalty. He was to be sent to San Quentin State Prison and placed in California’s only death row facility within ten days of the sentencing. Before court adjourned, Judge Conley set one final hearing for the following Friday. This was to settle the specifics of the financial restitution that Daniel Wozniak will pay to the Sam’s and Julie’s families. Prosecutor Matt Murphy was so enthusiastic about getting Daniel on his way to San Quentin, he suggested Daniel be driven the over four hundred miles right away and then be driven back to appear in court the next week. Judge Conley turned down that plan, but I suspect Matt Murphy would have offered to drive Daniel to San Quentin himself. Today I received my last letter from Daniel at the OC Jail. He’d written it just after I left on Sunday night. He said that as soon as our visit ended, the deputies told him to prepare to leave or “roll up,” if you’re using the vernacular of the incarcerated. That probably means they drove to San Quentin in the dark. I wonder if Daniel slept at all. I think he was planning to stay awake and see as much as he could see. Some of you won’t be happy to learn this, but Daniel isn’t scared or worried to be going to death row. He has a pretty good sense of what it will be like in there and already has friends “on the row” who he met when he was in the OC Jail. Also, once a person is actually in prison, there is access to a lot more creature comforts. So, he’s not really worse off. He did say he’d miss seeing me every Monday, but he’s pleased to have access to the San Quentin law library where he can find information for his own case, but more so, to help other inmates with their legal issues. Daniel Wozniak will never be able to make up for what he took from the Herr family and the Kibuishi family, but all he can do now is try to move forward, and be his best self from here on out. I think that’s the most anyone can do. After opening arguments in the penalty phase of Daniel’s trial, it was time for the prosecution witnesses. The first witness was Sam Herr’s best friend, fellow combat veteran Miles Foltz. Okay, if you are Matt Murphy, and it’s your goal to make the jury hate Daniel Wozniak, then Miles Foltz is a dream witness. Here was this tough looking solider guy who couldn’t stop his voice from cracking with emotion while he talked about his best friend Sam and how they were stationed together at Camp Keating in Afghanistan. Miles opened up about the daily dangers they faced during that time in “the fish bowl,” and how they joked about their bullet dodging skills. Sam and Miles had even made a “we’ll be each other’s best man” plan for when either of them got married, but when Miles Foltz did get married, his friend Sam wasn’t there. He had survived combat only to be was murdered after coming home. Sam’s dad Steve Herr stood in for his son as the best man at Miles wedding. Remember the end of the last post, when I told you to bring tissues.. The defense didn’t have many questions for Miles during the cross, but Scott Sanders asked him if he’d met Rachel Buffet and if she had ever made any comments about having an issue with a loan shark. Yes and yes. And during the re-cross, we learned this made him immediately suspicious of Rachel and Daniel. That’s one of the reasons Miles contacted the police and Steve Herr when Sam went missing. I had no idea that the term “loan shark” was still in use until this trial. The expression seems so Jimmy Cagney/Turner Classic Movies. When the grief-stricken Miles Foltz left the stand, Sam’s parents embraced him. The prosecution could have stopped right there and still easily convinced the jury to choose the death penalty. But they did not. Steve Herr (who pronounces his name like “hair”) is easily recognizable with his grey hair and blazer. During the hearings, he always wore jeans, but he switched to khakis during the actual trial. I’ve spoken with Steve on a few occasions and overheard him talking on many others. He is a chatty guy who has remained personable throughout this nightmare. All the media people know him. He greets with hugs and handshakes and smiles. This man who could be a “grandfather type” from central casting won’t have that opportunity now, because his only child was murdered. Sam grew up in California, near Magic Mountain. Without going into specifics, Steve Herr admitted that his son had gotten into some trouble when he was younger, but Sam had made a complete turnaround after joining the Army. “The event,” as Steve referred to Sam’s killing, happened right before finishing his first year of college. Steve Herr’s testimony was gut-wrenching. He often apologized about “rambling on,” as anger and frustration poured out him while he jumped from point to point. When he found Julie’s body in Sam’s apartment, he called 911 immediately and was positive that his son hadn’t done it. For reasons that were not explained, he’d had a deep fear that Sam would be dismembered, and then he found that to be the case. On his son’s birthday, he was praying that they find Sam’s head so they could give him a proper burial. “The worst thing you can ask of a man is to feel helpless,” he stated about not protecting his only son. He talked about his wife Raquel and how sad she looks when she sees people with their children. Steve Herr said of seeing Sam at his funeral that he “never want(s) to forget seeing (his) son all sewed up.” He never wants to forget the evil. Even though Steve didn’t personally witness the dismemberment of Sam’s body, he can’t stop picturing Daniel “hacking and sawing” his son. The human mind is fascinating. I don’t doubt what happened, but I’m personally not able to picture the man I know as my friend doing those horrific actions. Truth is, I have tried, actually, but the mental image morphs into him being on-stage and waving his arms around during a musical number. I probably just don’t want to be able to “see” it, you know? It’s easier to be his friend that way. When Steve Herr finished testifying, the defense chose to not ask any cross-examination questions. That seemed like the smart choice. Sometimes I feel like Steve might dislike Scott Sanders as much as he does Daniel Wozniak. The next witness up was Sam’s mother, Raquel Herr. This was the first time the jury would hear from Sam’s mom. Unlike Steve, she wasn’t an actual witness in the criminal case. Raquel said that even though she had been told she could not have children, she was blessed with her only child when she was 35. Sam was her “prince,” she told the jury, and while the police and her husband were searching for Sam, her fear and anxiety caused to her to be bedridden for six days. At one point, the judge had to ask Raquel to slow down for the court reporter. She apologized to the jury that her emotions and Spanish accent were making her difficult to understand. Raquel Herr said she has God and her faith, and she doesn’t want to be angry. She wasn’t on the stand for long, but her impact was powerful. Again, there was no cross-examination by the defense. After Raquel Herr, her twin sister, Miriam Nortman, took the stand. Sam’s aunt, the self-proclaimed “firecracker” in the family, was overwrought as she explained how difficult it was to see her sister suffer. She spoke of the joy felt by their entire family when Sam was born. But now Miriam’s own children and grandchildren are a constant reminder of what her poor sister lost when Sam was killed. Her anger and sadness boiled over as she explained that when she thinks about her nephew being dismembered, it makes her feel like her own arm, leg and head were being cut off. Again, the defense made the smart choice of not cross-examining the witness. Why upset these people more, right? There is the stereotype of the ruthless defense attorney who will do anything to free a client, but I just don’t think that is Scott Sanders. He seems like a guy who just cares a lot about the law and following it to the letter. The next group of witnesses would be members of Julie’s family, with Taka Kibuishi, Julie’s older brother, called first. This is not to belittle Sam’s murder, but just for me personally, the murder of Julie has always been the most heartbreaking in this crime. She just seemed like such a sweet and defenseless innocent. There really wasn’t a huge age difference between Sam and Julie, but Sam had seen so much of the world and he had faced death before. It’s like he’d at least had the opportunity to live, but she was just getting started. Also, she was a girl. Yup, I have a double standard there. Anyway, Daniel knows that I am particularly sickened by the murder of Julie. I don’t mince words with him. He knows that I am his friend, but I won’t ever forget why he is where he is. As you probably all know, Julie had been wearing a princess tiara when she was shot twice in the head. It’s a small element to the story, but its symbolism is gut-wrenching. She still lived at home with her parents, she had a Taylor Swift ringtone, and she was wearing a tiara when she was murdered. Julie was wearing that tiara because her brother Taka had given it to her over dinner. She had just been asked by Taka and his fiancée to be a bridesmaid in their wedding. Have you notices that there are a lot of weddings in this story: Taka’s, Miles’ and Rachel and Daniel’s? Taka continued by saying they’d gone out to a restaurant that evening to celebrate and “everything was great.” Six months later, when the police returned Julie’s car to her family, they would find the leftover Thai food that had been sitting in it since that dinner. Taka Kibuishi described the closeness of his family. He talked about how the two older Kibuishi brothers always looked out for the two younger sisters. There was help with studying and creating job resumes. Taka had even grilled Julie about her relationship with Sam, who Julie had insisted was just like another big brother. Julie Kibuishi was sweet, artistic, talkative and a great dancer. The arts high school that she’d attended is very close to the Santa Ana courthouse, so the Kibuishi family is constantly reminded of happier times whenever they return to this neighborhood. I have a personal connection to that arts school. The kids there are amazing. After a rigorous academic school day, they spend an extra three hours a day taking classes focused entirely on their artistic discipline. Taka’s love for his little sister was undeniable as he broke down on the stand, beating himself up for not stopping her from going to Sam’s apartment that fateful night. “I had so many chances to try to stop her,” he lamented. And Julie’s murder has caused so much stress and grief for this very private family. His anger flared as he described Daniel Wozniak as a disgusting monster who had disrespected his beautiful sister just to use her as a decoy. You know the expression, “there wasn’t a dry eye in the house?” Well, there wasn’t. The defense did not cross examine this witness either. At that point, Judge Conley decided to break for the day. As I watched the jury file out of the courtroom, noticeably moved by Taka’s words, the expression “another nail in the coffin” seemed fitting in describing Daniel’s fate. In the next post, I’ll continue with the prosecution witnesses and you’ll get to hear the defense’s argument for giving Daniel life without the possibility of parole. If you haven’t been following the story in the news, Daniel’s sentencing hearing has been re-scheduled for May. Scott Sanders is filing a brief to have the death penalty removed in Daniel’s case. Author’s Note: Much of what I write about on this site is anecdotal information related to me by Daniel Wozniak and other sources. In many cases, this information is not verifiable, and should not necessarily be taken as fact. I recently had dinner with a couple of close friends who have been supportive of my blog. They asked what was new and bizarre in my world and I told them that Steve Herr, the father of victim Sam Herr, had commented on the blog’s Facebook page. They both gasped. Actual simultaneous gasps. Then they jumped on their phones so they could read the exchange. Between bites of my vegan truffle burger, I pointed out that Steve Herr was very cordial in his postings. Unlike some previous commenters, he did not personally attack me for being friends with Daniel. I’d imagined that eventually there would be some sort of contact between me and the victims’ families, and I won’t lie to you, the prospect of it made me very nervous. I’m not ashamed of my friendship with Daniel Wozniak, but I understand that most people believe he is a vicious killer. Certainly no one has the right to feel that way more than the loved ones of Sam Herr and Julie Kibuishi. So, if Steve Herr had started throwing names and accusations toward me, no one could blame him. These two families have suffered unimaginable grief over the murders of their children, but to make matters worse, they have been waiting more than 5 years for some kind of justice and closure. There seems to be no end in sight. Well, I’m pretty sure I’d be losing it! I think I would despise the accused killer and want nothing more than to see him suffer for what he did to my family. Also, I’d be pretty pissed off is someone was publicly announcing a friendship with him. I have asked tough questions, and I will continue to ask without expecting answers… at least not necessarily true answers. I’ve never bothered to go into much detail about Daniel’s responses, because they are purposefully vague and contradictory. He has definitely learned his way around legalese in the past five years, and he’s a little cocky about it too. Nonetheless, I didn’t want Steve Herr (or anyone else for that matter) to think that I don’t care about the truth. I do. I just don’t know what it is. Conjecture is all I have. I tried my best to reply to his question, and I gave my opinion based on what Daniel has and hasn’t told me. I suggested that maybe Daniel didn’t murder Sam and Julie. It’s not surprising Steve Herr wrote back that Daniel is lying to me. I never forget that Daniel might lie to me about the case. From the beginning, I kind of assumed he would, or at least that he’d keep the truth from me. Accused murderers get interviewed all the time. When some guy in an orange jumpsuit tells Dateline‘s Keith Morrison that he’s never hurt a fly – well, I think maybe we all listen with a bit of skepticism. Daniel and I talked on the phone a couple of days later, and I was completely dumbfounded when he told me that Steve Herr had gone to the judge with the accusation that important information about the case was being shared with me, a person with a public forum. We live in a world where almost anyone can have a public forum at the push of a button. I spend a lot of time thinking and re-thinking about everything I write in this blog. I don’t take it lightly that there are real human beings behind this story and they are in pain. I’ve worried – a lot – about having what I write be misinterpreted. So what to do? I do my best. I do my best to be honest and clear. I do my best to be thoughtful and considerate. I do my best to not judge without facts, and to interpret what I am given. I do my best to engage and entertain the reader. I have my editor and my writer friends read over all my posts before they get published. Sometimes one of them might even suggest a title for the post that I think is clever and attention grabbing – later to learn that it just caused more courtroom drama. It turns out that the title of my post, “This Is How Daniel Bought Me Lunch,” may have been misunderstood. It was a joke. I’m going to add humor to my posts, but I don’t mean to be disrespectful. I can unequivocally state that Daniel did not arrange for the producer of 20/20 to buy me a $7.00 mini pizza and an iced tea. He has no control over what I write on my blog, and he is not trying to bribe me with the lunch special at CPK. That was another tidbit that was brought up in court last Friday. I’m glad I was out of town visiting family during that one. I’m not sure how I would have reacted if I’d been there. I’m guessing I would just sink down into the wooden bench and try to keep a blank expression on my face. Since I wasn’t there, everything I know about the blog being mentioned in court was told to me by Daniel. I’m not going to pretend that I’m writing as a journalist. I’m friends with Daniel. That does not negate my ability to believe that he may be guilty… of everything. I do occasionally question and play devil’s advocate when aspects of the case make no sense to me. That doesn’t mean I’m working toward any personal end-game as far as how this all plays out. I’m just sharing my opinions and thoughts, and discussing what it is like to be friends with the man at the center of this storm. What I write often shows the human side of Daniel. I am sorry if that is hurtful for some. I’m simply trying to share my experiences. Human beings are complicated. That’s just how it is. It’s never black and white. If People can call him the “Grisly Groom,” and make him look like a terrifying monster, then why can’t a blogger write about his human side? That’s what the next post will be all about: Showing the side of Daniel that I get to see. I’ll share some of favorite “Danielisms” with you. On Friday September 25th, Daniel Wozniak went to court. I went, too. I wanted to get my own take on what’s going on with this 754-page motion Daniel’s lawyer, public defender Scott Sanders, filed at the end of August. The overall goal of this motion as it pertains specifically to Daniel’s case? Daniel and his lawyer want a different judge. They want the Orange County District Attorney’s Office removed from the case and have it given over to the Attorney General’s Office (as happened in the Scott Dekraai case). They want the death penalty removed. Does 754 pages seems excessive to make just those three points? It isn’t hard to see that there is a lot more to this motion than just the parts that effect Daniel’s case, but, according to Sanders, it is all connected. There was a front page story in The Orange County Register this past Sunday all about Scott Sanders and how he is “shaking the Orange County legal system to its bedrock.” That is no exaggeration! I sometimes imagine DA Matt Murphy taking out his frustrations on a Scott Sanders voodoo doll that he might keep in his briefcase. Inside the Orange County jail, Daniel is receiving much more favorable reactions to all that has been happening in the OC legal system. At least from his fellow inmates. He gets thanked often; there are no dividing lines of race or gang membership when it comes to a dislike for the District Attorney’s Office. This motion is as important to Daniel as it is to Scott Sanders. Daniel and Scott are a team, working together to help people whose rights are being violated. You could say that this has become a life’s mission for both men. On the 25th, Daniel appeared first before Superior Court Judge Gregg L. Prickett. The courtroom was unusually full. There were quite a few of the victims’ family members and friends. Sam’s and Julie’s parents seemed to have a solid support group. They all waited so patiently while listening to hours and hours of legal jargon. The morning was spent on the Defense’s request that the currently assigned judge, John D. Conley, be taken off of Daniel’s case. Judge Prickett listened to arguments from all sides (including a third party I believe was a representative of Judge Conley) and, in the end, called everyone back on October 2nd to presumably make a decision. If Judge Conley is removed, that will mean a new judge will basically be starting from scratch, which will take even more time. There was a much shorter hearing in Judge Conley’s courtroom immediately following. The Judge made the obvious ruling that in spite of the previous scheduling, there would be no jury trial beginning on October 2nd. I don’t think that anyone was surprised by this, but there had to be some extreme disappointment from Sam’s and Julie’s families. In spite of this, they remained calm. As we were all leaving the courtroom, Steve Herr held door open for me. I thanked him and could swear he smelled like Old Spice, a scent that reminds me of my father, and of loss. Maybe it was just my imagination. Beyond learning more about the legal aspects of the case, and morally supporting my friend, I experienced a myriad of emotions that day. I find these court proceedings truly interesting. I’m fascinated to see in person what I normally watch on TV. I was also worried. Daniel was excited about the motion and happy that he had a friend in the crowd, and this caused him to repeatedly look back at me and smile during the hearing. I didn’t want my friend to smile at me, or to smile period. I want him to look serious or contrite or something that doesn’t resemble happy. I feel like that’s the way to go when you’re being accused of murder. I overheard the reporters from The OC Register discussing Daniel’s mood, and I was afraid that my presence would cause him to be described as “smirking.” I found out later that he was given warnings from the Deputies for looking at the audience. I don’t think Scott Sanders was pleased either. Daniel didn’t mean anything by it, but that doesn’t matter, does it? I won’t lie. This was exciting. I love 20/20! She and I talked a lot about my friendship with Daniel, our thoughts on the case, and all the legal wranglings that had happened that day. We discussed Sam’s and Julie’s families and how painful this whole experience must be for them. We also talked about my blog. I said that my topics go from jail mail to court proceedings. She told me that any program they might do on Daniel’s story will try to give a complete picture of him. I would hope so. I guess that includes talking to his friends and maybe even reading their blogs. Was A Victim Also A Killer? During one of my earliest visits with Daniel Wozniak, I asked him about something he’d mentioned in a recent letter. While listing off people who had come to visit him at the Orange County Jail, Daniel had told me that Steve Herr (father of murder victim Samuel Herr) had actually been there more than once. This surprised the hell out of me. Why would Steve Herr want to sit across from the man he believes murdered and mutilated his only son? Then Daniel gave me a brief and completely surprising explanation: In 2002, long before Daniel ever met Samuel Herr, there had been a different murder associated with that name. However, in that case, Herr was the accused. Daniel went on to surmise that possibly Steve Herr was worried that Daniel would “walk free,” just as his own son did years earlier. He didn’t know many of the details, but the main point was not lost on me. Sam Herr was once a defendant. Of course I started Internet searching as soon as I got home. I kept thinking, “as if this case wasn’t crazy enough…” The thing is, I couldn’t find anything about a murder case involving Sam Herr… well, aside from his own murder. When I eventually questioned him about the story, he didn’t know why I couldn’t find any information. He thought it was odd, but when you get right down to it, Daniel has a lot occupying his mind, so worrying about my inabilities to do a Google search wasn’t his top priority. It turns out that some of you readers are better Internet detectives than I am. This morning I got an interesting surprise on this blog’s Facebook page. One of you discovered there actually are a few news articles out there about Herr’s other murder case. These are stories that tell of a very different side to Army vet Sam Herr. Given those leads, I was able to find two articles from The L.A. Times and one from The San Diego Union-Tribune. Here’s the rundown: When Samuel Herr was 19 years old, he was tried for murder because of his alleged role in the stabbing death of another 19-year-old named Byron Benito. According to Benito’s mother, Benito and Herr had been close friends. In fact, prosecutors stated that it was Samuel Herr who picked up Benito at his house and then, on the night of January 15, 2002, led his unsuspecting friend to an area behind a mobile home park, where he was attacked and killed by a group of suspected gang members… one of which was Herr. The police believed that Benito was killed as gang retaliation for another murder, even though he was not associated with a gang himself. There were some accused who just plead guilty right away, accepting fifteen years to life prison sentences. That left 11 defendants to face charges of first-degree murder and conspiracy to commit murder. The DA decided to hold two separate trials, seemingly because there were so many being charged, and each defendant had a separate lawyer. Samuel Herr would be part of the second trial. All five defendants from the first trial were found guilty and sentenced to life in prison. The remaining 6, the ones from the second trial, were all acquitted. They walked out the courtroom as free men. From what I’ve read, an eyewitness who had testified in the first trial didn’t do so in the second. Was that the big turning point? Is one witness the reason that some people are behind bars and others got off Scott-free? Who knows what leads a jury to finding someone guilty or innocent? Maybe someone looked at Sam and saw a handsome and charming young man who they refused to believe was a violent gang member and a murderer. The articles I read made Sam seem like a cold and calculating murderer. Perhaps you can’t believe everything you read. I wasn’t in the courtroom. I didn’t hear the evidence. I’m assuming that Sam’s parents were there, though. I’d be surprised if they hadn’t been there supporting their son during his murder trial. Does that mean now they fear that the judicial system will work to Daniel’s benefit in the same way? Was justice served in Byron Benito’s case? I have to wonder if there were some people that were not elated when Sam was acquitted. Posted on September 16, 2015 September 16, 2015 Tags byron benito, jail visit, samuel e. herr, steve herr19 Comments on Was A Victim Also A Killer? Since I am no longer using a pseudonym for Daniel, I feel that it’s only appropriate to stop using pseudonyms for the victims. Daniel Wozniak is accused of the cold and calculated murders of two college students. Daniel and “The Vet” were neighbors. 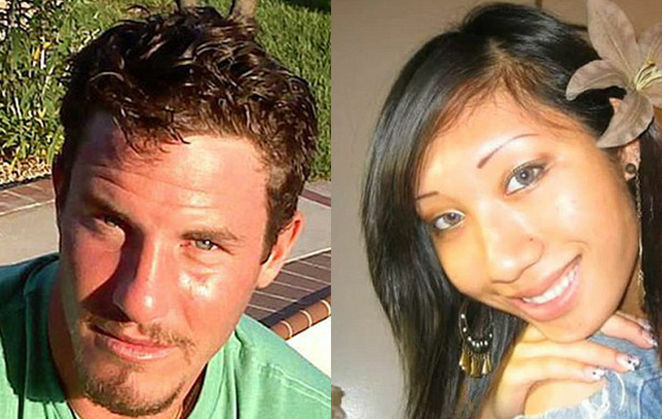 They lived in the same apartment complex in Costa Mesa, California. The police believe that Daniel murdered “The Vet” in order to clean out his bank account. Daniel is also accused of murdering a young woman who was a friend and tutor of “The Vet” in order to throw off the police. “The Vet” was Samuel E. Herr. He was 26. He was an only child. He was an Army veteran who had been a combat solider in Afghanistan. He was going to Orange Coast College on the Army GI Bill and had plans to one day become an officer. “Tutor Girl” was Juri (Julie) Kibuishi. She was 23. She was a graduate of OSCA (the Orange County School of the Arts). She was a student at Orange Coast College studying fashion design. She was also tutoring her friend Sam in anthropology. Julie was one of four children and is always described as a the kind of person who would do anything for a friend. My child is a student at OSCA. I went to Orange Coast College. I once lived in an apartment complex in Costa Mesa. It’s all so familiar. I don’t know if my blog will ever be read by friends or family members of Sam and Julie. The idea of it makes me nervous. I think about them a lot. My heart breaks for their families. I try to “put myself in their shoes.” It’s impossible. Truthfully, I don’t want to think about losing a loved one… especially a child. I see photographs of Sam’s and Julie’s parents, and the agony on their faces is plain to see. I’ve read that Julie’s father, Masa Kibuishi, has cancer. His daughter was murdered five years ago and he wants to live long enough to see justice done. Steve Herr, Sam’s father, has actually visited Daniel in jail a couple of times. He says he wants to know what happened to his son. He wants to understand. Both families have said that they want Daniel Wozniak to get the death penalty. I’m guessing they wouldn’t like me very much. Not that I would blame them. I am his friend. I try to show a human side to Daniel. I question if he’s even a murderer. Does that make me crazy? Naïve? No matter what Daniel Wozniak may have done, I don’t believe he should die for it. I understand why the families of the victims do, though.